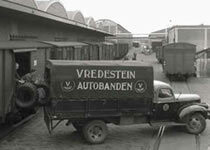 Although active in producing rubber goods as far back as 1908, the modern Vredestein concern was established in 1946. Now as then, Vredestein Tires B.V. is dedicated to the development, production, marketing, sales and distribution of tires for passenger cars, agriculture and industry. The setting up of a new business so soon after the Second World War required both courage and insight. The factory in Enschede was a joint Dutch-American venture, formed between Vredestein and BF Goodrich, and welcomed at a time when much of the area's industry was in ruins. The fledgling company started by producing tires that - although a real hit Stateside - were susceptible to skidding on Europe's roads of the time. Thus, in the pioneering spirit for which Vredestein was later to become renowned, a new tire was developed matching specific European requirements. In a quaint touch so reminiscent of those days, the Profilux was sold in a wrapper to reinforce the message of quality. The Profilux was the first of two prominent products of the fifties and sixties. 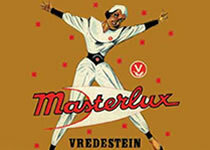 Like its predecessor, the Masterlux helped Vredestein become a force in the tire market - boosted by advertising which would raise the heckles of anyone even remotely PC-inclined today. The seventies were a less cheerful time for Vredestein. If economic recession and oil crises hit the company hard, the decision by Goodrich to withdraw from Europe altogether was a bombshell. Years of uncertainty followed as the big players jostled for shares and position: a period perhaps better remembered for the way the company's staff displayed fighting spirit and resilience in the face of such corporate turmoil. Recognizing the importance of Vredestein to the Dutch economy, the Dutch government finally put an end to the uncertainty in 1977, taking a 51% stake in the concern. This was to be a turning point: a new house style was introduced, closely followed by two tires. Very succesful throughout much of Europe, the award-winning Sprint ST 70 and the Snow + brought fresh elan to the Vredestein name. And this course was taken a step further by the equally-popular Sprint+ and Snowstar series that were all the rage in the eighties. The nineties have been a time of subtle yet revolutionary change for Vredestein. State support had given the company the chance to put its own house in order. By 1991, this process had clearly produced a thriving tire company with a long-term future. Thus, a group of investors under the name of Vredestein Investment Consortium (VICO), won the right to take over the state's shares. VICO immediately pumped in substantial financial backing to a policy that had been initiated a year earlier. This change of direction involved two facets. Firstly, to withdraw from mass, unprofitable markets to concentrate on areas where Vredestein was well-established. Secondly, to gear the development of new products to the precise demands of specific market sectors. This market-oriented philosophy has allowed Vredestein to maximize its attributes - flexibility, specialist know-how and R & D capabilities - by developing and maintaining products which are precisely tailored to needs. In the car tire sector, the result has been the Vredestein Trac generation: The Quatrac, Protrac, Snowtrac, T-Trac and Wintrac. Similar momentum was shown in the agricultural sector: Typified by the Traxion+ rear radial tire, with its remarkable new tread pattern, and the award-winning Flotation+. Listening to the market in a sophisticated and targeted manner has proved a winning formula for Vredestein. Most recently, this approach has taken the company into uncharted waters as far as the tire industry is concerned with a number of innovations in the design field. First up came the Axenta, offering fashion-conscious car drivers a choice of distinctive red or yellow markings on the sidewall.This was followed up in 1999 by the groundbreaking introduction of the Sportrac - the first tire in the world to come with the signature of a top design office. The enormous and immediate success of the Sportrac gave further stimulus to Vredestein's confidence as it entered the 21st century - and reinforced its conviction that the future lies in premium quality, tailor-made tires with more than a hint of design. As befits a company that has made such great strides in recent years, Vredestein is fully prepared. Apollo Vredestein B.V.: A special company with a unique combination of independence, market-orientation, creativity and flexibility. Vredestein's strategy is crystal clear: to produce tires with an optimal price-quality ratio. As a middle-sized, independent tire manufacturer, the best way to implement this strategy has been to opt for a flat organisational structure. Decisions can be taken quickly and reliably, and enable an even faster development of original products. Thanks to heavy investment over the recent years, the production equipment in the Enschede-based premises is state-of-the-art. It is perfectly geared to the complex task of producing an incredibly wide range of tires on one site. Car tires for summer, winter and the ever-more popular all season tire. Tyres for vans, tires for tractors and tires for a whole host of agricultural and industrial applications. And, of course, our unique spare tire concept. At Vredestein we are acutely aware that our success depends on the satisfaction of our customers. Yet the interests and needs of these customers are extremely diverse. With this in mind, customer requirements are continuously charted and analysed. But marketing theory is worthless without experience on the ground. Our employees in the field are a reliable source of a great deal of market information. The know-how gained from these activities serves as a key driver at Vredestein because only satisfied customers can help us develop the next generation of tires. And satisfying customers is the ultimate challenge. 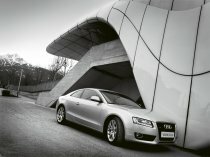 Analysing market needs helps our marketing personnel to define the tire of the future. Our goal is to market at least two new product lines each year. Concepts such as safety, innovation, creativity and design are essential prerequisites when developing new products. In many ways Vredestein is a trend-setter with its products. Take for example the Sportrac, the first production tire with a top-designer's signature. Giugiaro Design, one of the most renowned design houses in the transport industry, was responsible for the appearance of this high-speed tire. At Vredestein, tire dealers are more then just customers - they are partners in business. Vredestein supports these partners in every possible way. Know-how, expertise and service are the keywords within this relationship.